In the Summer Term we will be hosting our second Open Day of the year for prospective families to visit our Nursery. Please look out for the date and time. This week we have been following on from our story of Jack and the Beanstalk. We have been learning about seeds and plants and how they grow. We have been busy preparing our raised beds for our vegetables and to plant the seed bombs which we have made. We have been planting some pretty flowers to brighten up our outside area. We have talked about the different parts of a plant and had a really close look at a plant with an advanced root network. We even played 'Plant Hospitals' and re-potted some plants who needed bigger pots. We went out to look for signs of spring and found lots of spring flowers peeping through the ground and lots of new buds and leaves forming on bushes and trees. On Friday we spent some time planting our own peas which we are going to look after and watch them grow into healthy pea plants. We have also planted some beans in a bag and put them on the windows so that we can watch them sprout and grow. We have had a busy week! This week has been Science Week. We have been exploring science in our learning this week. We have been using soap and paint to make coloured bubbles. we used the brushes to whip it up into a foam and then washed everyone's wellies with the foam. we explored Newton's First Law of Motion with pendulum painting. We even took it outside to see if we could make patterns in the nursery garden. On Friday, we explored thrust. We made balloon powered cars and watched them shoot along the track. 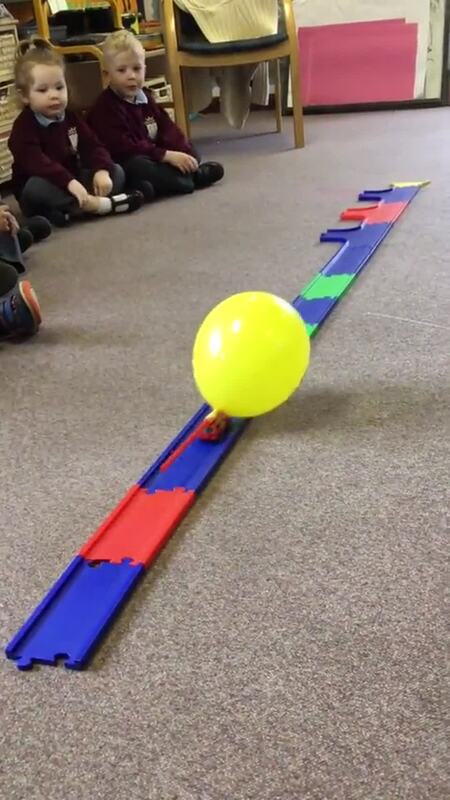 This also prompted a discussion about friction and the children asked whether the car would travel further on the carpet or on the track. There was lots of scientific learning going on this week. we have a very inquisitive bunch of mini scientists in Nursery! Following on from the story study last week, we have read the story 'Blow Your Nose, Big Bad Wolf'. This is an alternative version of the Traditional Tale and explains how the wolf only wanted a tissue and that he didn't mean to blow the pig's houses down! This stimulated lots of discussion about germs and how it was important to use a tissue when you needed to sneeze. This week we also learned about Shrove Tuesday and why we ate pancakes on this day. We practised our number recognition by flipping the pancakes. We ran pancake races and negotiated obstacles whilst we were flipping the pancakes. On Tuesday afternoon we followed a recipe to make pancake batter. We then had a pancake station for children to come and watch their pancake change as it was being cooked. They then ate their pancakes with some sugar and lemon. They were very tasty!! This week we have been learning about the story of The Three Little Pigs. We went for a walk onto the big field and collected sticks. We set up the Construction Area so that we could build houses for The Three Little Pigs. We used straw, sticks and bricks to investigate which made the best house. We have a Traditional Tale cottage full of story clues for the children to act out the stories and have been busy making little pigs in the Creative Area. Nursery have been sharing the love this week. We have had lots of Valentine's fun, making love heart biscuits and having selfies with our loved ones! This week we have been learning about Chinese New Year. We have explored our Treasure box full of Chinese objects. We have been talking about some of the traditions celebrated at Chinese New Year. We have a fabulous Chinese Restaurant role play area which the children have enjoyed dressing up as chefs and cooking noodles and stir fries for the customers. We have had lots of sensory rice play and noodle play in the water. We have read the story of The Chinese Zodiac and acted out the story using story props. We have watched lots of video clips and listened to music which has helped us to have our make up our own Dragon Dance. We used musical accompaniments to accompany the dance. we finished off the celebrations with a Chinese Banquet. We ate stir fried noodles and prawn crackers. This week we played number splat outside, this involved recognising numbers incorporated with the physical skill of throwing. One very cold day, our dinosaurs got stuck in the ice! We had great fun rescuing them. We used the glitter mark making tray to write our names, numbers and even a spider! We all enjoyed the process of making our polar bear pictures in art. We used chopsticks to swirl paint into shaving foam, we then pressed the paper onto the paint and left it for a few seconds. We then pulled the paper back carefully and used a ruler to scrape the paint off. We were left with a beautiful marble pattern. Our topic this term is ‘Where does snow go?’ We have been learning about arctic animals, investigating ice, cutting snowflakes, reading in the igloo, cooking in the cosy winter cottage and meeting new friends. We have had such a festive week! We have been rehearsing for our Nativity play, singing songs and dancing. We went on a trip on The Santa Special, met Santa, watched a magic show and sang songs. In Nursery we have been busy elves in Santa’s Workshop, making toys, painting toys, wrapping presents and writing cards etc. We have been learning about lots of Christmas traditions. We have started learning about The Nativity story this week. We read the story about the Little Owl and the Star, this introduce us to the characters in the story. Every day we looked at the new characters who were introduced throughout the story. We talked about their jobs and what they did then we learnt a song about that character. This story is helping us to prepare for our Nativity show which we will soon be performing for our loved ones. We have also been continuing with our topic on light and dark. We investigated shadows using the shadow puppet theatre and constructed rockets out of 2d shapes. This week we have been reading Whatever Next. We have been thinking about the moon and what we would take if we were going. We have used the props to retell the story. We have been using shapes to make rockets and have been using the light box to investigate lots of different translucent objects. We have also been experimenting with torches, switching them on and off and using them to find creatures in the Dark Den! Finally, we had a wonderful end to our week when a mystery Tree Fairy sent us a Christmas Tree. We finished our fabulous week with a story by the light of the Christmas Tree. Our Book of the Week was Oliver’s Wood! We talked about the animals in the story and loved spotting the alliteration in “batty bats!” We had great fun thinking of alliterative sentences using our names... ‘Marvellous Max’, ‘Excellent Eddie!’ We had a visit from the Mayor on Monday. She enjoyed watching us make our hedgehog bread. We have been working on some Tara maths activity ideas making all of the group equal. We have also spent some time painting our very own pictures of nocturnal animals which we are going to use in our own Information book about nocturnal animals. On Friday we were extremely busy, PE in the morning, balancing, jumping and rolling. Then tree planting in the afternoon. Our Book of the Week was Owl Babies, we read the story and talked about situations where we might feel sad. We talked about what we could do in those situations and the children came up with some very good ideas. We talked about Democracy this week and voted on which book we should read at lunchtime. The children understood that voting was a fair way to decide. We have used sponges to paint our very own Owl Babies which are displayed in the cloakroom. The children talked about the story as they were painting and repeated phrases from the story. We used Bar Modelling to help us find different ways to make the total 5. We used objects, pictures and cubes to provide a visual representation of the problem. Finally, we had a very Crazy Hair Day on Friday to raise money for Children in Need. Thank you for your kind donations to a wonderful cause. On Monday, we started our week making pumpkin soup. We peeled, sliced and chopped the vegetables and enjoyed eating the lovely soup at snack time. It was the “best we had ever tasted!” We spent the week preparing for Remembrance Day. We painted poppies and also cut out poppies to place on our tribute to the fallen which is displayed outside Nursery. We painted Remembrance Rocks and used our weaving skills to make some small crosses. We also learnt about Diwali, the Festival of Light. We explored Rangoli Patterns and made our own Diva lamps in the play dough. This week we have been reading the book Pumpkin Soup by Helen Cooper. The children did some wonderful story telling in our Woodland tray and repeated the phrases from the story whilst playing with the characters. We also opened our new Role Play area, which is a Toy Hospital. The children love putting on the white coats and gloves and turning into doctors. We had Forest Friday and had a campfire. We toasted marshmallows to make s’mores and collected leaves to use in class. We also had fun hiding the pumpkins in the trees. This week we read the story of Lost and Found by Oliver Jeffers. We talked about the qualities of a good friend and how we can be a good friend to others. We have been counting with our autumn treasures, adding the spikes to the hedgehog and finding the correct numeral to match the quantity. We were also inspired by Andy Goldsworthy to make our own Transient Art using our autumn collection. We have been very busy making our own Rainbow Fish this week. We used our handprints and added our own scales using lots of different materials. We also counted up to 10 very special shiny scales and put them onto our fish. We have been experimenting with mark making and squiggling. Our counting is fantastic, we counted the teddies and then found the number on the 100 square. This week we have been reading the story of The Rainbow Fish. We have talked about what makes a good friend and how we can be a good friend to others. We have decorated our own numbers to create our very own number line. We have been matching the Numicon pieces to the correct shape. We played Guess my instrument and we have been completing lots of pre-writing activities to get us ready for writing. This week we have been helping our new friends to settle in. We mixed colours when we made friendship handprints and made our own apple pies from scratch! Our topic this term is ‘Do you want to be friends?’ We have been meeting up with old friends and finding out about our new friends. This week we have read the story ‘We’re going on a dragon hunt’. The children were fab at joining in with the repeated phrases in the story. We have practised our cutting skills and created our own dragon pets to keep Hector company. The children loved reading ‘There is no dragon in this story’. They enjoyed looking for the familiar story characters in the story. It was a lovely crossover book from traditional tales to dragons! This week we have read the story of The Very Hungry Caterpillar. We have been watching our very own hungry caterpillars grow and this week we actually saw one hatch out of its chrysalis before our very eyes! What an amazing experience. We have been learning about symmetrical patterns. We have had a really busy week this week. We have been reading the story of The Three Billy Goats Gruff. We have had a Royal Wedding Winner, Selfie Sation, Bee Day, Year 2 friends over to play. We have been fishing for numbers, drawing Trolls, completing an obstacle course and painting rocks! This week our Book of the Week is Chapatti Moon. We have had great fun chasing chapattis, making chapattis and eating chapattis. We have been looking forward to the Royal Wedding on Saturday. This week we have been reading The Gingerbread Man. On Thursday afternoon we had a visit from The Gingerbread Man. He jumped out of the oven and ran away! We chased him all around the school! After an exciting, exhausting chase, we caught him in the end! This week we have been reading the story of The Magic Porridge Pot. Can you guess the story we have been reading this week? This term our topic is “Will you read me a story?” We started our topic with Jack and the Beanstalk. Today we went for a walk around the school looking for signs of Spring. We found lots of trees with buds starting to grow. We found daffodils, primroses and daisies starting to flower. We listened for the birds and spotted a bird’s nest in the tree. Can you spot any signs of Spring when you are out and about this Easter? Today EYFS visited Smithills Farm. We all had a wonderful time. First, we all had a ride on a donkey. It was a bumpy ride but the donkeys were very friendly. Then we fed the sheep, pigs, ponies and alpacas. After that, we went on a very bumpy tractor ride up to the horse field. At the top of the field we stopped the tractor and fed the horses. The biggest horse, Jack, was a greedy horse and ate all of our bread! It was then time for lunch. We had our picnic and had a quick trip to the park. Then it was time to watch the cows being milked. Our final activity of the day was Pet’s Corner. We had plenty of time to stroke, cuddle and feed the baby animals. It was a fantastic experience. We feel very lucky to have been a part of it. Our topic this term is ‘Do cows drink milk?’ We will be learning about life on a farm. This week we read the story ‘Say Hello to the Animals’ and we have been making fingerprint Sheep. We also read the story of The Lost Sheep and have been counting sheep in the field. We have had a great time playing in the snow this week! Today we celebrated numbers on Number Day and raised money for the NSPCC. Today we had the privilege of watching the Watoto choir perform in our school. Our children had a wonderful time and were dancing in the aisles throughout the performance. The members of the choir are such an inspirational group of people.